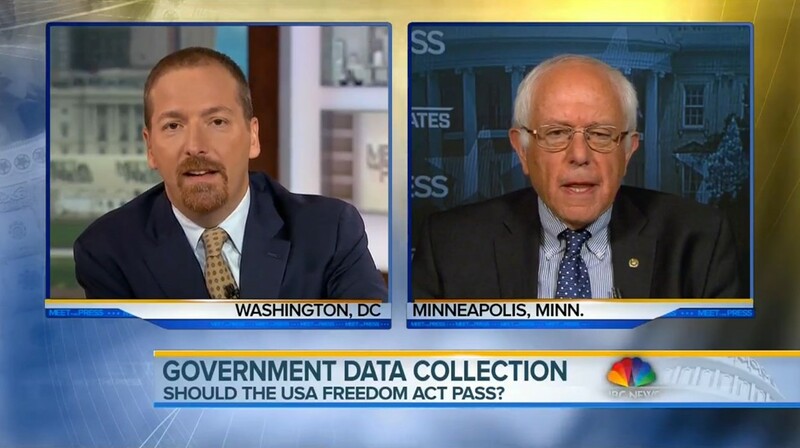 Chuck Todd and Sen. Bernie Sanders on "Meet the Press"
In an appearance Sunday on NBC's "Meet the Press," Sen. Bernie Sanders (I-Vt.) called for an earlier start to the presidential debate season than proposed by the Democratic National Committee. He also suggested that Democratic and Republican contenders should debate one another before the parties select their respective nominees. "By the way, on broader issues, what I think when we talk about issues, Chuck, we need a lot more debates in this campaign," Sanders told moderator Chuck Todd. "I hope very much that we can begin with the Democratic candidates at least as early as July, and also Republicans in those debates, as well." Sanders did not explain on the show how such bipartisan primary-season debates would work — nor why they would be a good idea. But in a press release issued by his campaign later that day, spokesman Michael Briggs elaborated. "Early debates involving both Democrats and Republicans also could revive interest among ordinary voters in the democratic process," Briggs wrote. "One way to get disillusioned voters to participate in elections would be to make it clear that there are major differences between a progressive agenda and the reactionary platform of the Republican Party. That is why Sanders suggested debates including Republican candidates as well as his Democratic rivals for the nomination." The Democratic National Committee announced in May that it would sanction six Democratic debates starting this fall in the early primary and caucus states of Iowa, New Hampshire, Nevada and South Carolina, and in two other states. The party did not say precisely when the first debate would take place. If Sanders were to participate in earlier, unsanctioned debates, he might run afoul of the DNC's so-called "exclusivity requirement." "Any candidate or debate sponsor wishing to participate in DNC debates must agree to participate exclusively in the DNC-sanctioned process," the party wrote in its announcement. "Any violation would result in forfeiture of the ability to participate in the remainder of the debate process." Sanders' appearance on "Meet the Press" came near the end of a busy week of campaigning. After formally kicking off his quest for the Democratic nomination in Burlington last Tuesday, the candidate traveled to New Hampshire, Iowa and Minnesota. According to his campaign, "more than 2,000 people" filled a basketball gymnasium Sunday in Minneapolis to hear Sanders. The campaign claimed that more than 10,000 people attended his events last week. On "Meet the Press," Sanders found himself on the defensive over a 1972 piece he wrote for the Vermont Freeman touching on gender politics in rather graphic terms. "I'll be honest with you, Sen. Sanders, it's uncomfortable to read," Todd said. "Can you explain this essay?" "Sure. Look, this is a piece of fiction that I wrote in 1972, I think," Sanders said. "That was 43 years ago. It was very poorly written. And if you read it, what it was dealing with, gender stereotypes, why some men like to oppress women, why other women like to be submissive. You know, something like 50 Shades of Grey, very poorly written 43 years ago."